If you have a smart phone (iPhone is smartest) (grin) there’s the best choice of all with the complete Rule Book (including Prescriptions; special rules for racing in the USA) and Dave Perry’s commentary included right in the Rules. Find it in the app store on your smart phone. $17. Might be a non-iPhone versions too. Also note: “J/105 Fleet #1 Class Exceptions/Articles of Association 12/21/16”. This is mostly for Protest Committees as it simply makes our Fleet Rules that conflict with Class Rules enforceable. You can download the fleet weigh-in form as a fillable PDF that you can download, print, and save. If you have trouble opening this file, right-click it to save it to your desktop, and then open it from there. Note that this version (updated in 2013) includes ISAF ID’s and sail tag numbers for all 3 sails. This information is only required for the Rolex Big Boat Series and National events; for other events these sections can be ignored. Instructions for obtaining current ISAF certificates can be found here. Support your local J/105 Fleet!!! Updates on Fleet Business, Seminars, Regattas, Socials and More. Pay $40 annual dues, with check payable to J/105 Fleet #1. 100% of this fee is remitted to the National Class to support class operations. Send membership form and dues to the person listed on the Owner Membership Application page. Please note that joining Fleet One as an Associate member does not automatically make a person a member of the J/105 National Class Association; that must be done separately. 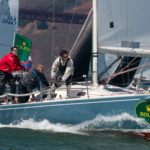 In addition to being a “Long Term Shipmate”, membership in both the Fleet and Class is necessary for a person to be able to drive in a regatta. View the current list of Fleet #1 boat weights. The Addendum to the Class Weight Certificate is available in Word format here. See National Site weight rule 7.3 C & D. Addendum Form available in MSWord or PDF formats. Special thanks to our fleet measurer, Pat Benedict, who has carried the “organizational weight” during this process. 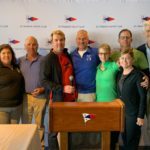 This document has been drafted for Yacht Club race committees that have expressed an interest in hosting a J/105 Fleet #1 season counter regatta (i.e., “A Season”). The schedule can be found here. The following is a checklist of basic considerations for sponsoring an event. 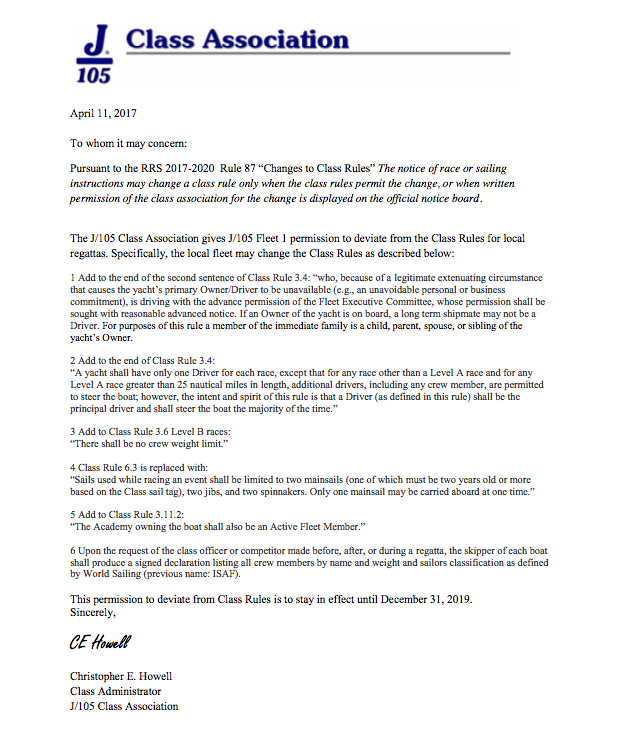 These are intended to be “guidelines” to running a successful J 105 race event and meant to increase Race Committee (RC) and Yacht Club awareness of some “Big Fleet” issues peculiar to J/105s as we can have anywhere from 15 to 25 boats on the starting line. In many cases they may be modified due to the nature of the event (fun races versus A Season races) and the number of J/105s participating. Is a Certified Race Officer on the Race Committee? Does the RC have enough assets (mark boat, pin boat)? Is the RC capable of setting an offset mark at the windward mark and a gate for the leeward mark if the size of the fleet dictates? Is a protest committee available on race day? We require the start line be set with at least 1.5 boat lengths (35’ x 1.5) per boat. Does the RC know how to set the line to accommodate tide and oscillating wind shifts? What are the proposed race venue and courses? What is the mean low low depth on the course? 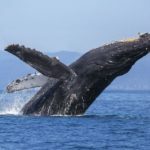 Has a Coast Guard permit been requested through the YRA? Are any pre/post race activities planned? Are trophies to be awarded? It is the preference of the fleet that there be no throwouts in each regatta. 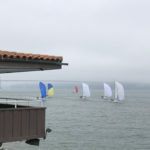 Any interested Race Committees should contact a member of the SF J/105 Excom to propose getting an event on the schedule. All events are established via Fleet Annual Meeting approval of Excom-recommended events in November of each year for the FOLLOWING year. Accordingly, you should have your proposal submitted and approved by the excom by the end of October of the year BEFORE the season in which you are interested. 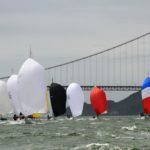 Fleet 1 is dedicated to preserving and promoting racing and social activities for its members and being an active and supportive member of the San Francisco sailing community. Fleet 1 is interested in expanding and including new and varied race venues, club sponsors and activities and will work with you to accommodate and further our mutual goals and objectives. For more information, contact the Fleet ExCom.